The stretches of black volcanic rock landscape is trimmed by a chain of multi-hued mountains only broken by the green of the odd cactus plant that has managed to flourish. The dark hues offer a sensational contrast with the low-rise white-washed towns that have sprouted up along the coastline. There is the odd dash of colour courtesy of painted window panes usually, green or brown but overall the island has been protected by the kind of tourism that demands high rise architecture. This is thanks to the initiative taken by celebrated artist and designer Cesar Manrique who insisted on maintaining the island’s natural beauty. Often his architecture works with it and he created some amazing homes by integrating them into the rock face of a volcano. We take a tour of the artist’s contributions to his beloved island. Fortune can be fickle and there cannot be a more eloquent example than what took place in a villa in the village of Oasis de Nazaret in Lanzarote. This wasn’t just any villa, this was a dream home built into the side of a volcano and commissioned by Dr Zhivago star Omar Sharif. It was based on a design by Cesar Manrique and was created in a style that evokes the Arabian fairy tale 1001 Nights. Known now as lagOmar, the actor never got to live there. While filming the 1973 film Mysterious Island, the Jules Verne classic, he challenged Sam Benady, the British developer behind LagOmar, to a bridge game. Omar was unaware he had challenged the world bridge champion and staked the house. Unfortunately he lost. But all is not lost – at least not to visitors – because the home has been converted into one of the finest restaurants on the island. There’s a a bar and lots of interesting nooks and crannies to explore. There are also some moody black and white photographs of the ill-fated bridge game hanging on the wall with accompanying notes that tell the story. Entry: €5 for adults and €2 for children over 12 years. It is now the HQ of the Cesar Manrique Foundation and was designed and built on the site of volcanic eruptions by the artist himself. Large double doors open to a courtyard where the top of a palm tree peaks through one of the volcanic bubbles below. There are five volcanic bubbles (pictured above) and all have been used as rooms. One, called the White Room, pays homage to the fellow artists Georgia O’Keeffe and Barbara Hepworth. The central cave has a swimming pool a barbecue and even a dance floor. Cesar Manrique was a noted sculptor and several roundabouts around the island are showcases for his work. The round-about just by his home hosts one of his most famous sculptures – Fecundidad. It stands tall and white and a farmer, his wife and their animals can supposedly be picked out by the observant. 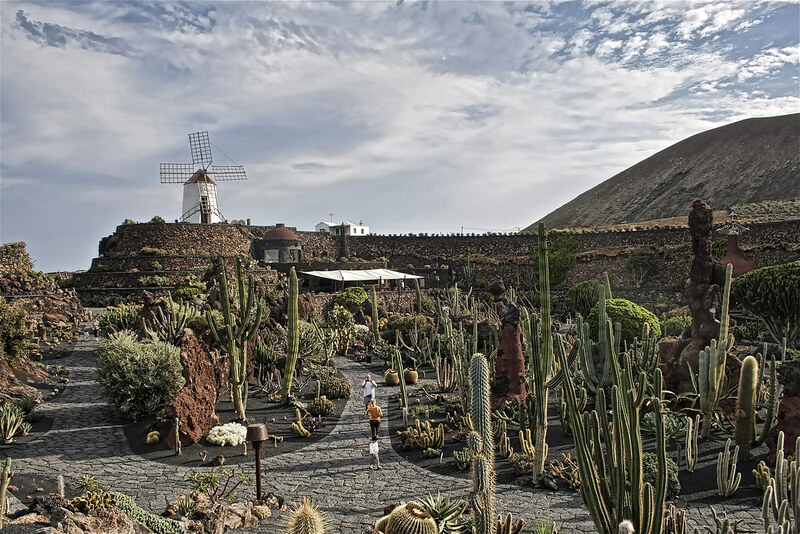 Manrique was also the inspiration behind the cactus garden in Guatiza, a cactus growing region, where 300 acres are dedicated to the exclusive cultivation of the Tunera cacti. There are 1,100 varieties of cactus and it’s an amazing insight into an otherwise unknown prickly world. At La Graciosa in the north Manrique built the Mirador del Rio into the rock above the island’s northern coast. The entrance is almost hidden but if you can find it, climb the white staircase to a restaurant that has floor to ceiling windows and a large viewing terrace that offer sensational views over the sea. Manrique’s favourite creation is the Jameos del Agua, an intriguing and surprising cave complex. The descent is via a stone staircase that leads to a restaurant within the volcaco (pictured above). A further descent leads to a lake and a delicate walk along the wall path reveals a host of tiny white crabs that dot the clear water. At the other side of the path, a few steps lead up to a bar and and a few more steps ascend into the sunlight and on to a scene of a white pool that you can swim in, white sand and palm trees. It is so beautiful that Rita Heyworth was moved to call it “the eighth wonder of the world”. A theatre and a nightclub are also part of the complex. There are times when a simple, rocky, grim landscape can look stunning and this is a good description of the Timanfaya National Park. The statue at the entrance, known as “El Diablo”, the Devil, was created by César Manrique as its symbol. The park is a geological creation, the result of violent volcanic eruptions in the 18th century. It has no trees, very little signs of life other than the odd lycen growing on the lava and could be mistaken for a moonscape. This is why the whole island was declared a UNESCO Biosphere Reserve in 1993. Perhaps the most surprising part of the island is its vineyards that have been cultivated in La Geria. Clever viticulturists realised that by covering the ground with a layer of volcanic ash (picón), what lay beneath retained its moisture and could be cultivated. They grew crops – tomatoes, melons, figs and sweet potatoes. They also grew grapes and began what is now a long tradition of wine making. El Grifo winery, one of the oldest on the island, has been producing dry whites and desert wines since 1975. Their logo, a griffin, was designed by Manrique who also created the griffin statue at the entrance to the estate. The artist helped redesign the warehouse into a fascinating museum that contains a collection of antique barrels, wine presses and distilling equipment. A far more polished operation is the Stratvs winery that has been eked out of a hillside in a distinct Manrique style. Everything gleams from the exterior to the state-of-the-art facilities. After a tour, a shaded courtyard offers the indulgence of tapas and a glass of malvasia white wine and other goodies. There is a lot to stir the soul on this small island, and with sunshine all year round and the legacy of Cesar Manrique, this island is a holiday winner. 5* Hesperia Lanzarote offers all the luxury you would expect of a five-star hotel without the snooty, superior attitude often associated with a hotel of this calibre.